William H. Gerdts, New York, by at least 1965; gift 2018 to NGA. Gerdts lent the painting to a circa 1965 exhibition at the American Federation of the Arts in New York; per documentation provided by Abigail Booth Gerdts, in NGA curatorial files. [Still lifes of edible subjects from the collection of William H. Gerdts, on occasion of publication of cookbook by William and Lois Katzenbach], Board Room, American Federation of the Arts, New York, c. 1965, no catalogue, label no. 14. Mid-Nineteenth Century American Painting from the Collections of Henry M. Fuller and William H. Gerdts, Cummer Gallery of Art, Jacksonville, 1966, no. 40. 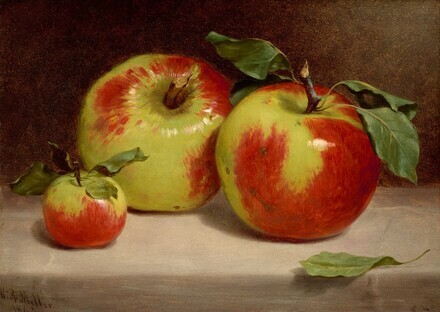 The Apple of America: The Apple in 19th Century American Art, Berry-Hill Galleries, New York, 1993. For Beauty and For Truth: The William and Abigail Gerdts Collection of American Still Life, Mead Art Museum, Amherst; Berry-Hill Galleries, New York, 1998, unnumbered catalogue, repro. Gerdts, William H., and Russell Burke. American Still-Life Painting. New York, 1971: 106, fig. 7-7.